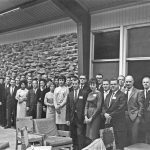 I have spent a lot of time recently talking about the future of SIU, but I have also been impressed by the amazing things this institution has accomplished throughout its past. For instance, you may know Special Olympics is celebrating its 50th Anniversary this year, a celebration that kicks off Friday at Touch of Nature. But I recently learned that Special Olympics might never have happened at all if it weren’t for the contributions of SIU. Here’s a little information about how it all started. 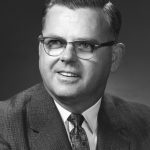 The university “loaned” faculty member and recreation pioneer William Freeberg to the Joseph P. Kennedy Foundation by special request of Sargent and Eunice Kennedy Shriver. Freeberg taught workshops showing people how to work with individuals with disabilities. One of the participants was Anne McGlone, now better known as longtime Illinois Supreme Court Justice Anne McGlone Burke. She was so enthused she returned to Chicago and began planning a citywide track meet. Freeberg helped, securing funding from the Kennedy Foundation and permission from the International Olympic Committee to use part of its name. On July 20, 1968, the Special Olympics was born at Soldier Field with 1,000 athletes from 26 states and Canada participating. Burke and Freeberg’s granddaughter, Brittney (Freeberg) McGovern will be special guests and speakers at Touch of Nature’s Special Olympics 50th Anniversary Kickoff Celebration. Opening ceremonies are set for 10 a.m. Friday at Touch of Nature, located about eight miles south of Carbondale on Giant City Road. Activities will include free food, sports, crafts, backyard games, exercises, camp songs and dance, musical entertainment and much more. Join me to help celebrate a big milestone for an amazing organization at my favorite university. 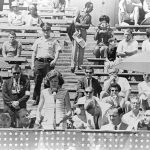 Eunice Kennedy Shriver speaks during the first Special Olympics games in 1968 at Soldier Field in Chicago. 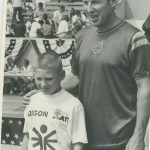 Astronaut Jim Lovell poses with a Special Olympics athlete at the first Special Olympics games on July 20, 1968, in Soldier Field in Chicago. 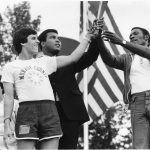 Muhammad Ali, center, and Rafer Johnson, right, with Special Olympics athletes at the 1979 International Summer Games. Freeberg, fifth from the right, poses for a photo with colleagues in the Sledgefoot Lounge at Touch of Nature Environmental Center in Makanda. Awards ceremony at the first Special Olympics.